Thirsty Pilgrim: Another Heavy-Handed Hedonistic Post. Stop and smell the roses. We've been told that since we were kids, if not by our parents then at least by popular culture. A simple message: Stop, pay attention, enjoy life. A lot of people forget to do it. Or so I've heard. My theory: That's the real secret behind food-and-drink pairing. More broadly it may also be a driving force behind craft beer, great wine, the foodie movement, and so on and so forth. Nothing revolutionary here: People seek greater flavor because they want greater joy in their lives. But about pairing—with beer and food, for example—there is no real magic there. I wouldn't even call it science. There are a few matches where identifiable flavors in a food either harmonize or complement those in a beer. And there is a much wider range of foods and beers that both taste great while not stepping on any toes, let's say. But the real trick, and it's almost sleight of hand, is getting someone to pay attention to what they're tasting. It's fun to really taste something good, to tap into what is literally your sensual side. Somehow it's even more fun when you know that someone—a brewer or a chef, for example—has used a lot of passion and knowledge to make it better for you. There is special communication there, even if there is money involved. And there usually is. Stop and smell the roses. Some people pay good money to be reminded of it—how about $350 for this meal in New York (with a hat tip to Andy Crouch). But you can do it far more cheaply at home, or in your favorite local corner restaurant. Unless you're the sort that always needs to be told what to do. The shot here was from a birthday dinner at Restobiéres a while back. 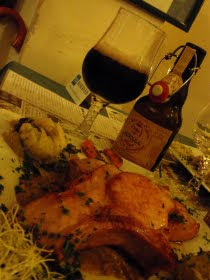 A robust Hercule Stout with roast piglet. Neither stepped on any toes. It was joyous. And considerably less than $350. Best self-help article I've read in ages. As someone who has stood his fair share of criticism for speaking and writing -- sometimes at length, I freely admit -- about beer and food pairings, I agree with you wholeheartedly, Joe. Although with one caveat. 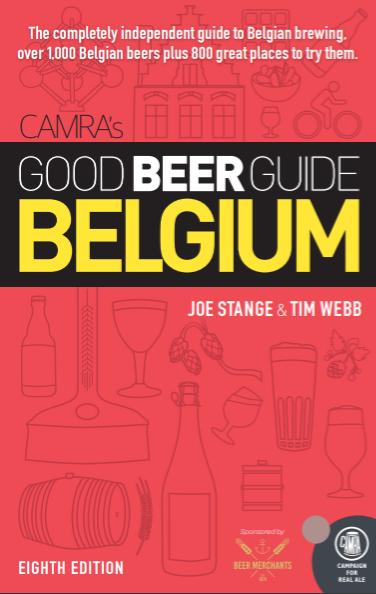 Great, really great, food and beer pairings are the ultimate in hedonism, as they take two wonderful gustatory experiences and form something new out of them that is grander than the sum of their parts. It's what I strive for with every pairing I make at every beer dinner I host, and there is little more satisfying for me than seeing people's eyes light up as they eat and drink.